The Balco B940 is now obsolete. 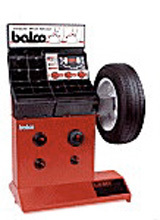 The b930 handspin wheel balancer uses the latest Balco microprocessor giving a specification that includes 6 balance modes, tyre matching and self calibration. 240 vac and 12vac make this an ideal choice for mobile or static situations. The b940 also provides extra weight storage and a greater visual presence to that of the b930.